The phrase “tickling the ivories” doesn’t even come close to describing the musical fireworks that will emanate from the Vail Jazz stage in this year’s iteration of the popular Piano Duos offering. 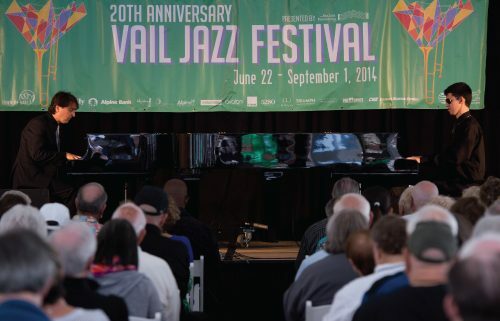 Vail Jazz audiences eagerly anticipate the stunning improvisational antics that always ensue as some of today’s most highly lauded piano impresarios—presented in various combinations—thrill, awe and inspire with their real-time mind-melding musical revelations. This year features Luke Celenza, John Chin, Bill Cunliffe, Benny Green, Tamir Hendelman and Tyrone Jackson. This special show is part of the Saturday Afternoon session, which begins at 11:30am.